The addition of regular workouts to an exercise regimen allows the individual to focus on particular muscle groups. For the upper body, the shoulder press is a logical inclusion in a regular routine and can provide various benefits. Dumbbells, barbells, kettle bells and resistance bands can all be used to execute the shoulder press, and there are machines that can assist with this exercise and eliminate the choice of specific weights. Begin by standing with feet at slightly less than shoulder width apart. Next, wrap your thumbs around the bar as you grasp it, with hands slightly further along the grip than they would be at the width of your shoulders. For a bar that is sitting on a shoulder rack, gently slide the bar off and allow it to rest against the front of your shoulders. If the bar is on the floor, however, it is best to use a sudden exertion of power to bring it off the floor and to shoulder level in one continuous motion. Tense the shoulder blades and push forward with chest muscles. Press the bar over your head, moving your head out of the way as the bar passes. Push the bar at an angle over your head, so it briefly comes into line with the back of your head. Hold the bar still at that point, then begin lowering to the shoulders once again. This completes the first repetition. The primary thing to remember is the body needs time to rest between completions of the workout. For that reason, it is best to only plan this exercise for once each week. Next, always remember the first repetition will be the hardest. Then, muscle memory will kick in and reflexes will assist with the rest of the repetitions. Therefore, you need to be at your toughest for that first repetition. Finally, do not allow the bar to come in contact with your upper chest. If this occurs, it is best to raise your elbows. Push Press: The Push Press involves bending the knees slightly and bouncing as you use force to send the bar above your head more quickly. Bradford Press: The Bradford Press involves lowering the bar slightly behind your head, then raising it again before allowing it to return to the position against the front of the shoulders. This keeps tension on the deltoid muscles during the entire repetition. Here it is important to note that anyone with neck, elbow or lower-back issues should not attempt this exercise, or at the very least individuals with these issues should proceed with caution. 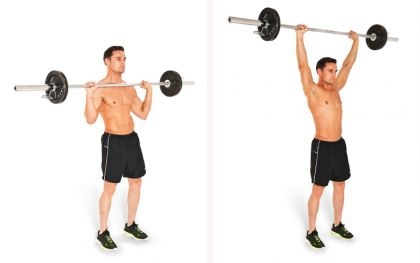 This exercise targets the shoulders while providing some focus for the upper back and triceps. Begin by sitting on a bench with back support, planting feet on the floor at a width roughly the same as your hips. Have a dumbbell in each hand. Bend the elbows and raise the upper arms so they are at shoulder height and the dumbbells should be even with your ears. Tense the abdominal muscles, allowing a slight gap between your back and the support. While doing this, rest your head against the support. Next, push the dumbbells over your head so they touch. Make sure this occurs directly over your head before you begin lowering the dumbbells to their original position. This completes the first repetition. Make sure to hold the body still while lifting the weights above your head. If possible, make sure to keep your head against the back support while keeping the natural curve of your back so your entire back is not touching the support. Keep elbows rigid but do not lock them while lifting the dumbbells. Finally, keep elbow joints in line with the shoulders during the lowering portion of the press. These efforts will increase the shoulder press benefits. 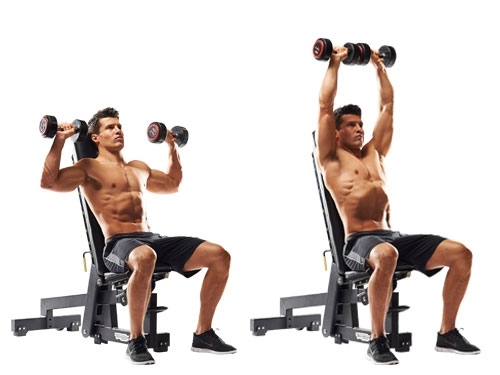 If for some reason you prefer not to use dumbbells, there is the alternative of a shoulder press machine. These are typically found in any gym. If you choose to use this machine, ensure that the pulley is lined up with the middle of your shoulder. Next, hold the handles, pull the abdominals in tight while maintaining the natural curve of your back and push forward on the handles of the machine. Do not lock the elbows. On the return, lower the elbows to a position slightly below shoulder level. Shoulder press can help you to improve your strength significantly as it has a positive impact on the deltoid muscles, as well as the triceps, the upper portion of the pectoral muscles and the trapezius muscles. The use of this exercise becomes even more important for those later in life, as muscles tend to decrease with age. This leads to even more weakness. Bones respond to weight lifting in a manner similar to muscles. They are forced to adjust to the greater weight they are supporting. This builds bone strength along with muscle. Mineral density is also increased as a result of exercises, adding decreased risk of osteoporosis to the list of shoulder press benefits. Since osteoporosis is a serious concern for a great percentage of women, adding this exercise to your regimen means a lot of really big benefits. This exercise also results in better core stabilization, as it requires the stabilizing muscles in the elbows, wrists and shoulders to keep joints in place while lifting. In return, those muscles are strengthened, and the individual's balance and posture are improved as a result of this exercise as well. A standing shoulder press really optimizes this particular benefit. This exercise helps decrease the chance of injury if you are a regular swimmer or softball player. In addition, lacrosse and other sports where the upper body and arms are constantly in use can be played without a high rate of injury. Meanwhile, this exercise also helps improve your abilities when it comes to bench pressing greater weights and doing higher reps of hand stand pushups.